This page lists all reports that for Spain only that do not involve other countries. Click here for a list of all reports involving Spain. This bicycle tour in Andalucia was a mix of cycling along the sea on the Costa del Sol and visiting few panoramic mountains (Mirador Cabra Montes, Haza de Lino, etc.) and cycling on the mountains of Sierra Nevada and Sierra de los Filabres. Bwtween Nerja and Castell de Fero the coast is wonderful with romantic bays. On the most memorable day we cycled up to Pico Veleta (3394 m) which can be reached on the highest finishing paved road and offers wonderful panorama. Above 2500 m we had very heavy wind gale. Once it lifted my touring partner's bike as he was walking next to it (he felt too dangerous to cycle there). Standng at the peak we could see Granada and the landscape around it , the coast, the Alpujarras and thanks to the wind we could see Gibraltar and a little bit Africa too. Another interesting memory was to cycle though the semi-desert of Tabernas and meet and look deers by sunset at the ridge of the Sierra de los Filabres. Last year we biked some serious hills in the French Alps; so we wanted something less strenuous this year. We decided to go to Spain for a change, and settled on a trip through Andalusia from Granada through Cordoba, Seville, Cadiz, then the Mountains to Ronda and finally to Gibraltar. The Spain Island of Majorca is always a good choice for winter-weary bicyclists to warm up the lazy bones. It is advisable to check the hotel prices which vary from • 20,- to • 70,-. Quoted prices for half board. Attention, never take an unknown hotel below three star. It will never fulfill a bicyclist expectation. Sometimes even three-star hotel are questionable. I have rented the bike by paying the rent via PayPal in advance. The rent is more or less the same as the airfare price to transport a bicycle. My dealer has taken the bicycle right to my hotel. Great service! On my tour, I have been lucky, only two cold days. Nevertheless, I kept on riding... One week = sweet 740 kilometers. For me, it looked the Puig Major road has been extended (or my 'winter-weary' body came down to an utmost weak point). Enjoy the report and the pictures. Good luck to all followers. Eine Rundfahrt in Andalusien in 11 Tagesetappen über 874 km. Tagesetappen zwischen 46 und 101 Kilometern. For Europeans, Canary Islands are a perfect winter training place. At the end of the year, when the winter grips Europe with cold, fog and damp, the European "wannabe" racing cyclists start to panic. The hard work throughout the year and investment in developing muscles and superior VO2 is lost in just a few weeks of non activity. At that time their sad eyes turn to the south, to warm inviting places where the sun still provides much needed training, enabling that essential tenth of a second of advantage over their opponents on a club ride in the spring next year. Sigue la flecha amarilla! è sulle pietre, sui muri, sui cartelli stradali, sui tronchi degli alberi, per terra... è ovunque si possa disegnare e ti guida verso la meta..
Again Majorca... bicycling Soller, Orient, Puig Major, Galilea Pass, Randa, Rather demanding by distance: round 200 kilometres (from Palma on...). A recommended place to go in Spring time. April is the latest - in May the motor bicyclists arrive... Our natural enemies. Enjoy the pictures! Good luck to all the followers! Note: George Sand was a woman (who has dressed as man...) I like those confusions...! A recommended place to go in Spring time. April is the latest - in May the motor bicyclists arrive... Our natural enemies. Enjoy the pictures! Good luck to all the followers! Mallorca has become another standard training tour... Staying at Palma de Mallorca, we bicycled all the standard tour: beside, Soller, Orient, Puig Major, Gallileio, Randa, we did the tour to Formentor this year. Rather demanding by distance: round 200 kilometres I(from Palma on...). A recommended place to go in Spring time. April is the latest - in May the motor bicyclists arrive... Our natural enemies. Enjoy the pictures! Good luck to all the followers! I have followed the whistle... In our group has been so many popular guys; e.g. three participants of the official tour d`Autriche, the president of the Austrian bicycle union... I have been learning... Staying at Palma de Mallorca, we bicycled all the standard tour: Soller, Orient, Puig Major, Gallileio, Randa, etc. A recommended place to go in Spring time. April is the latest - in May the motor bicyclists arrive... Our natural enemies. Enjoy the pictures! Good luck to all the followers! I had a wonderful time, everywhere I went the people were friendly, the drivers reasonably considerate, and the touring spectacular. Why the Extremadura? The Extremadura is a very interesting part of Spain for any American because the people in Extremadura have had such a profound impact on the history and development of America. It turns out that the two most famous (or infamous) conquistadors, Pizzaro and Cortez, both hail from the Extremadura. Many other Extremadurans joined them in the conquest of central and south America by the Spanish. Why? During the early 1500's, the Extramadura was a relatively undeveloped part of Spain, filled with minor nobility and controlled by absentee landlords. There were few prospects for a second or third son growing up in this region, and it was a tough neighborhood. The region had long been a contested area in the wars between the Moors and the Spaniards, it was dotted with walled towns, and inhabited by enduring people accustomed to hardship and violence. The opportunity for wealth and fame in the Americas was a magnet for aggressive young men who had few prospects for inheritance and were well trained to fight for what they wanted. Some of them did achieve wealth and fame, very few of them died peacefully in their bed. Un cicloviaggio praticamente indimenticabile, 12 tappe da Saint Jean Pied de Port a Santiago de Compostela, passando per i monti della Navarra e i vitigni della Rioja, attraversando le immense distese delle mesetas tra Burgos e Leon, salendo in alto verso la Cruz de Hierro e il Cebreiro per ridiscendere infine verso i boschi e i saliscendi della Galizia. Il racconto di un viaggio di 850 km lungo le strade del mitico Cammino di Santiago!!! 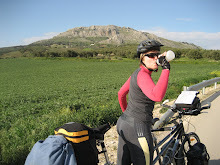 Spain -- bicycle tours of two piciclisti who only have bikes in their mind. We visited Spain in October 2007, for 14 days and our route followed from Malaga on the Mediterranean coast, north to Seville, Cordoba and Granada. The roads varied in condition. Mostly they were in good shape although some of the back roads could be bumpy after being patched over several times. If we had one complaint about Spanish roads it was that sometimes we struggled to find a quiet alternative to busy routes and in cities like Seville it seemed almost impossible to leave without running into endless motorways. A six-day tour from Bilbao to Valencia in Spain. 710km cycled, stopping over in Bilbao, Vitoria-Gasteiz, Calahorra, Calatayud, Teruel and Chelva. Highlights included: tasting percebes in Bilbao, wine for lunch amidst truckers at Los Arcos, tailwinds out of Calahorra, the plateau south of the Sierra Moncayo, 35K of downhill to Calatayud, Man Utd winning the Champions League (watched in Teruel), and getting a true taste of rural Spain at Bar Neutral in Chelva. From dodging bandits to sidestepping trucks, surviving the famous Camino de Santiago pilgrim's way in Spain hasn't changed that much since the sandal made way to the cycling shoe. This is a trip report of my two week mountainbike tour on the Camino, following the route from St. Jean Pied de Port in France to Santiago de Compostela in Spain. Included are a background history, detailed packing list and some tips on preparation and logistics for your own tour. Web personal en la que comparto mis experiencias en el uso de la bicicleta y la información sobre viajes de cicloturismo que tengo o preparo. Consejos para el uso tanto como medio de transporte habitual como medio de disfrute ocasional. La Asociación VIA VICENTIUS VALENTIAE está recuperando el CAMINO DE SAN VICENTE MARTIR, un camino histórico de Huesca a Valencia para senderistas y ciclistas que rememora los pasos del santo, cuando en el siglo IV fue apresado en Zaragoza junto al Obispo Valero por los soldados romanos enviados por el Cónsul Daciano y trasladado a Valencia para sufrir martirio ante la negativa a renunciar a su fe. Así la difusión del conocimiento de este hecho provocó en los siglos siguientes una corriente de peregrinaciones desde toda Europa hasta Valencia para visitar los restos del mártir en San Vicente de la Roqueta, convirtiéndose este fenómeno en algo muy anterior a las peregrinaciones medievales a Santiago de Compostela. This is a brief description of our tandem tour in Andalousia(Spain). We did cycle for nine days, visisted the main cities (Seville, Granada, Cordoba) and combined bicycle with train. A six-day tour through the hills and plains of southern Spain. 544km cycled, stopping over in Antequera, Castro del Rio, Fuencaliente, Ciudad Real and Toledo. This tour was a baptism of heat and hills through the olive groves north of Malaga, giving way to cooler weather, stunning landscapes and beautiful plains as we neared Madrid. Lost and confused in Sevilla - the Western Pueblos Blancos - a place of great national touristic interest (the Costa del Sol) - the ride to the rock (Gibraltar) - the un-Sevillianized side of the the mountains (the Eastern Pueblo Blancos) - a meeting with another cyclist - the endurance challenges of Granada - Eating out Iberian style - Coke cans and the art of bicycle repair - the skirt of the mountains (the Alpujarra road) - the cycle tourist as caveman - more. From Avila, great cycling on the northern slopes of the Sierra de Gredos leads into the dramatic north east corner of Extremadura via Candelario. Good climbs over the Puerto de Honduras and through Piornal follow before travelling southwards towards the beautiful town of Trujillo. East over the hills to Guadalupe completes a rich Extremaduran experience followed by an interesting return to Madrid that includes a trip along the via Verde de la Jara.